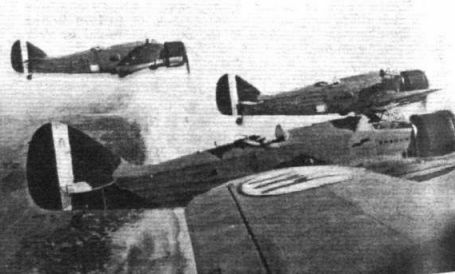 The Morane 405 zooms after a dive past some of the assembled prototypes. 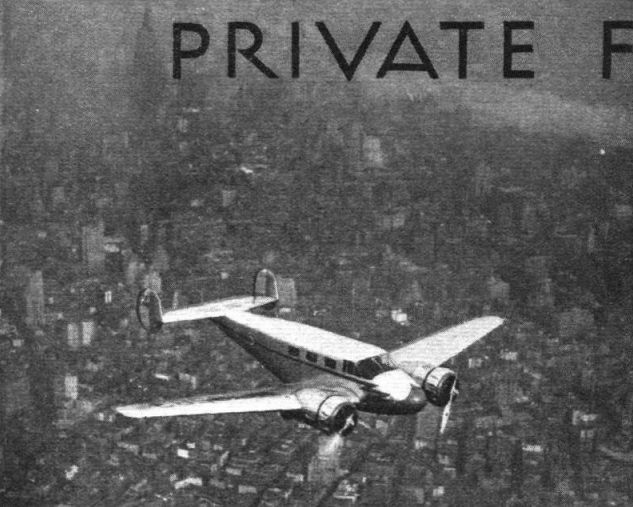 THE REAL THING: Not long ago one of the new Jacobs-engined Beechcraft 18s was flown from New York to Philadelphia and back at an average speed of 125 m.p.h. 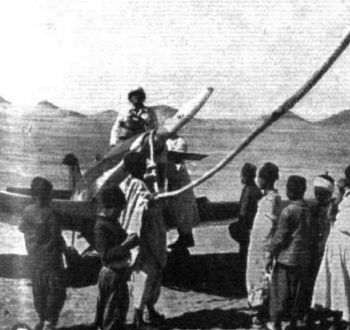 on one engine with a normal load. 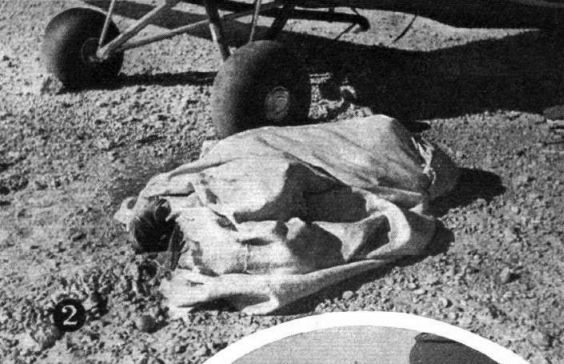 Immediately after the take-off the port engine was switched off and a brake used to stop the airscrew. The machine climbed to 4,000ft. for the trip. 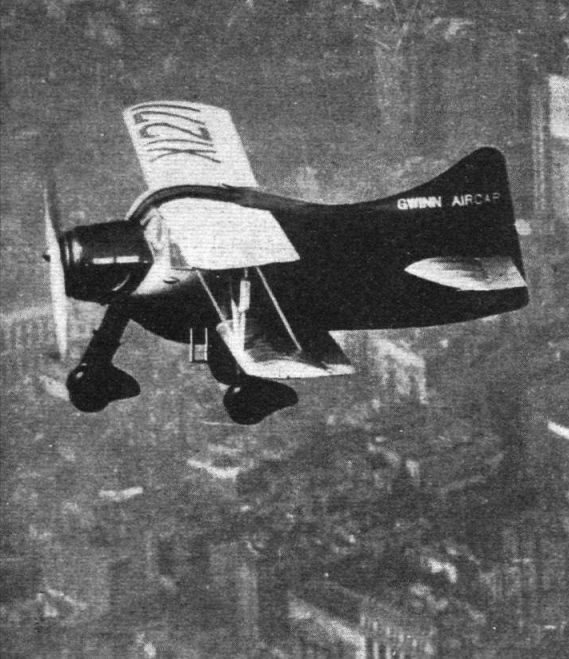 This photograph was taken as the machine was flying over New York. 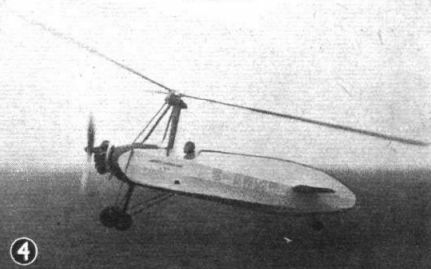 TWENTY-FIVE YEARS OF PROGRESS: A 1911-type Deperdussin seen flying strongly (or "in full flight") in the year 1937. The engine is a 35 h.p. 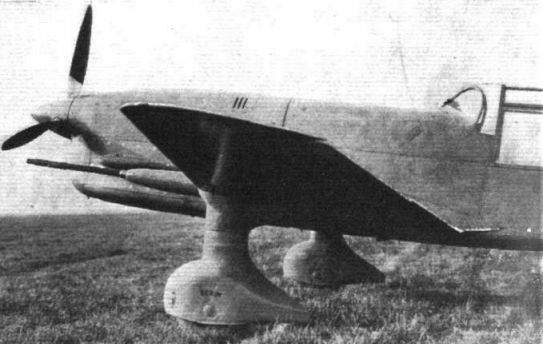 Y-type Anzani and the maximum speed is about 55 m.p.h. The pilot (with quaint accident-hat) is Mr. R. O. Shuttleworth, at whose works the machine, amongst others, was re-built. 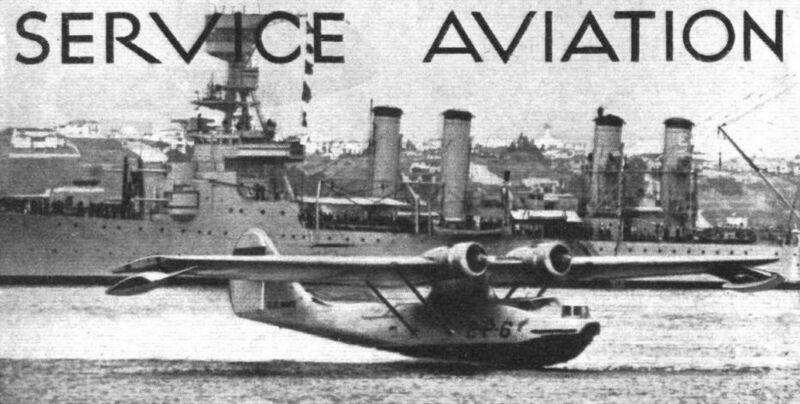 A consolidated PBY flying boat of the U.S. Navy taking off from San Diego for the Panama Canal zone, 3,080 miles away. Thirteen machines made the trip non-stop. 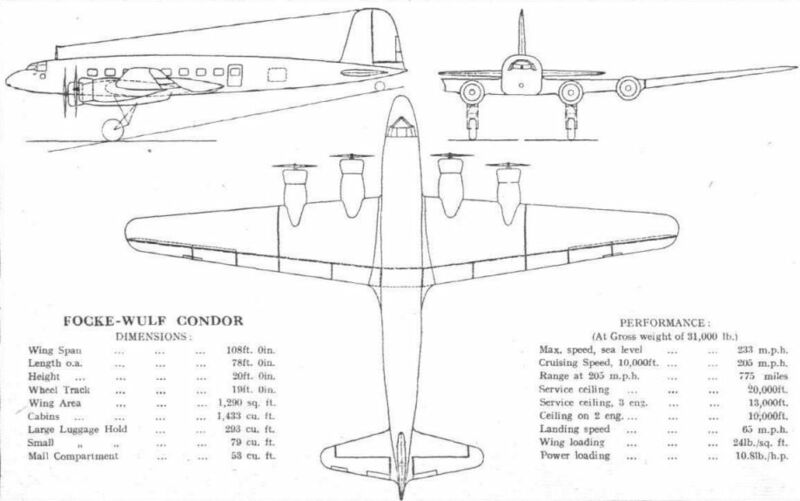 THE CONDOR IN BEING: A few weeks ago there was published on this page a composite picture showing a model of the Focke Wulf Condor four-engined transport. The machine is now flying and its fine lines are apparent here. 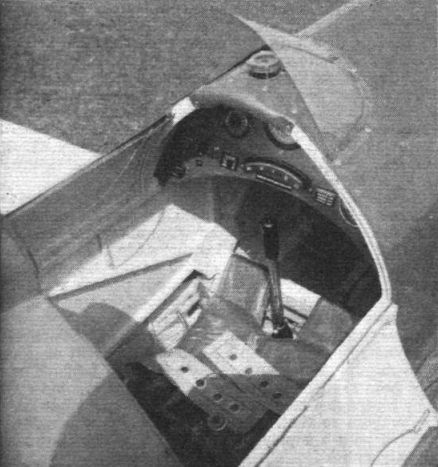 The cockpit of the Focke-Wulf Fw.200 or Condor. 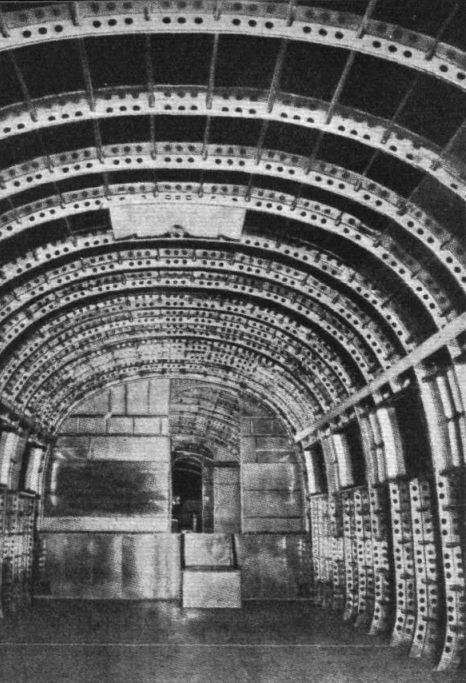 View inside the main cabin, looking forward. Note the steps over the rear spar in the door to the smoking room. The construction is fairly clear from this picture, taken before the walls were soundproofed. 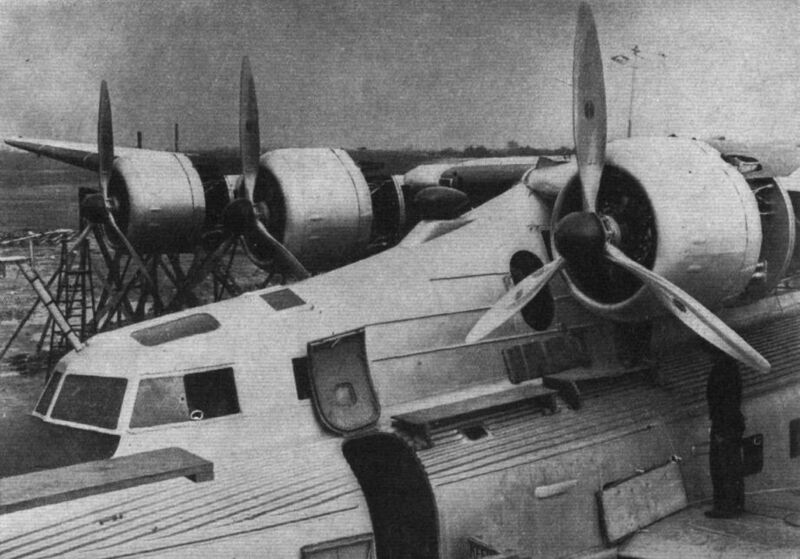 FRANCO-GERMAN: This Dornier Do.17 bomber, one of twenty ordered by Rumania, has two 950 h.p. Gnome-Rhone 14 No. radials. Normally fitted to the Do.17 is the Daimler-Benz inverted vee, liquid-cooled. 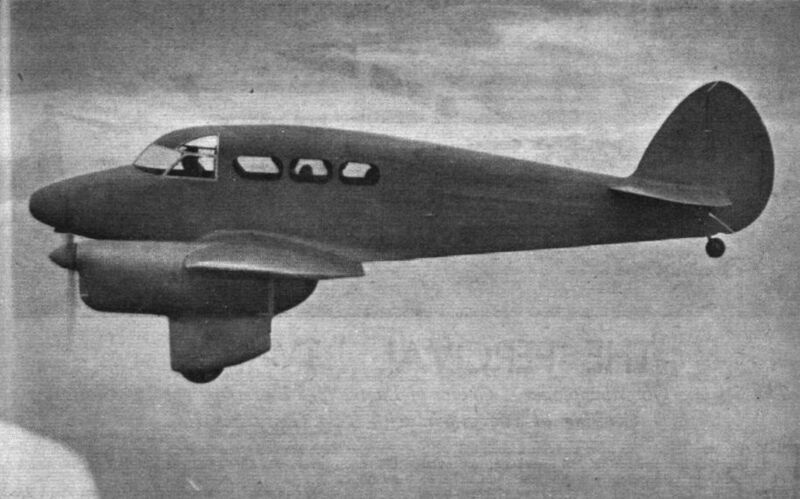 AN AMERICAN "WET": The new Curtiss P-37 single-seater pursuit monoplane with 1,000 h.p. Allison liquid-cooled engine, the first American machine of its type to be fitted with anything but a radial for some years. It seems that the exhaust-driven blower is housed more carefully than in previous installations of the Allison. 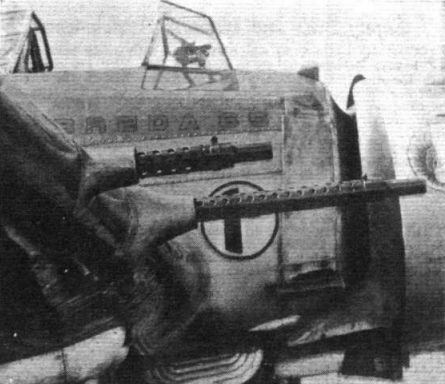 A view of the installations of one of the wing-mounted "cannons" on the comparatively small Caudron-Renault single-seater fighter. 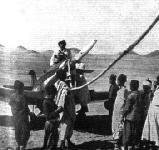 THE LONG-RANGE WELLESLEY: H.M. the King, during his tour of aircraft factories last week, was shown the long-range Wellesley in the Vickers works. It will be seen that the nose of the machine has been modified as compared with that of the standard Wellesley. 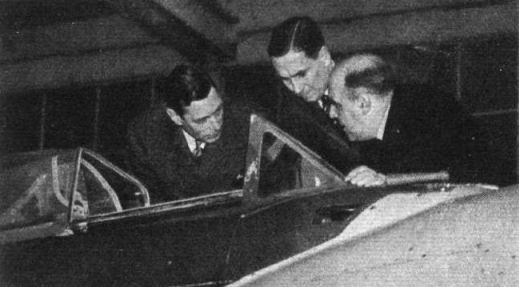 At Brooklands: The King took particular interest in the Wellesley, which will be the research machine for the new R.A.F. 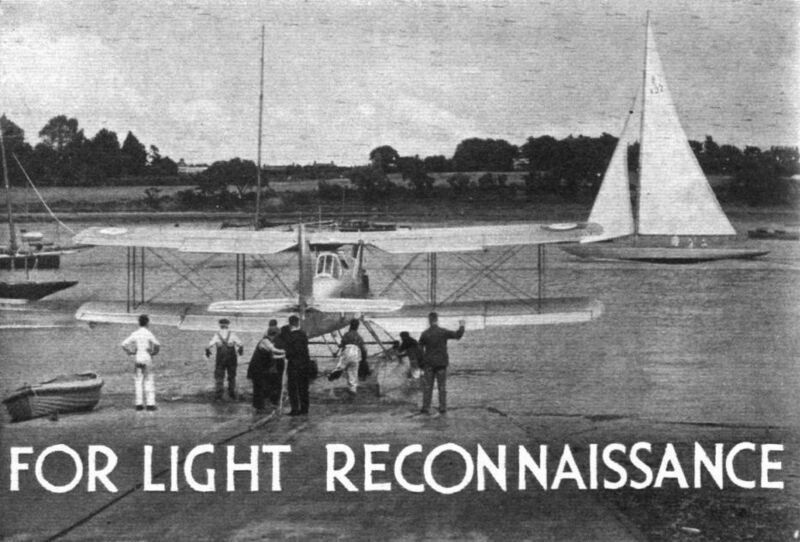 Long-distance Flight. 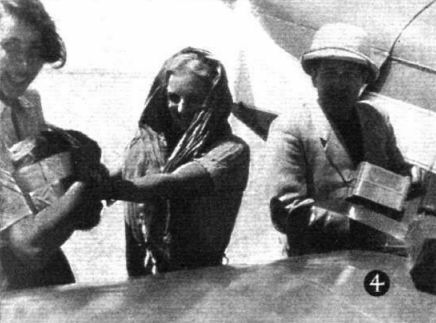 He is seen with Mr. T. C. L. Westbrook and (right) Mr. Rex Pierson. 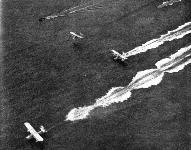 An Egyptian sentry guards French Farman heavy bombers picketed out during their eastern cruise. 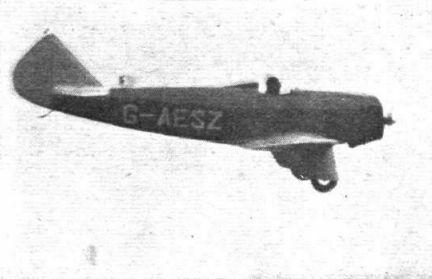 Despite its angles, Codos' Farman does well over 200 m.p.h. with four medium supercharged Hispano Xirs water-cooled engines. The radiator installation is a point of interest. 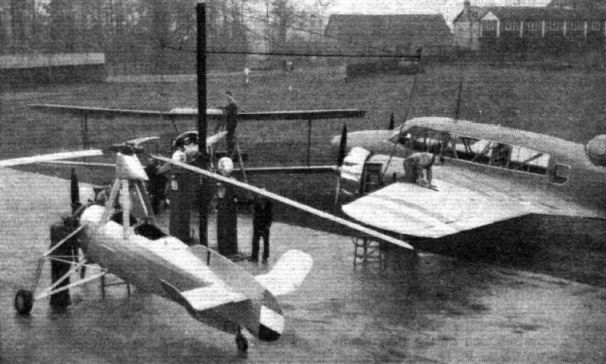 NATIONS AT THE FOUNTAIN: A Yugoslav Autogiro (Genet Major), a Portuguese 626 comprehensive trainer Cheetah) and an Irish Anson reconnaissance machine (two Cheetahs) in a "feeding time" scene at Woodford, Avro's Manchester aerodrome. 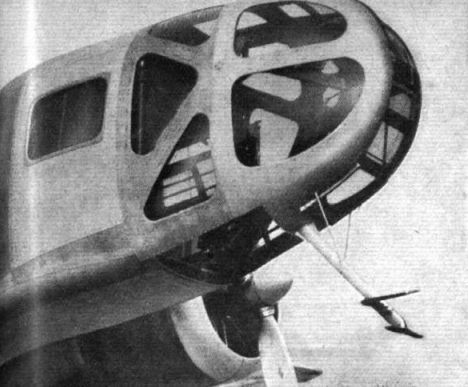 The Anson is fitted with flaps. ITALIAN ATTACKERS: The flying arsenal, a portion of which is seen, is the Breda 65. Four fixed guns are mounted in the wing, each pair being staggered as shown, and there is a fifth gun for the observer in addition to fragmentation bombs. 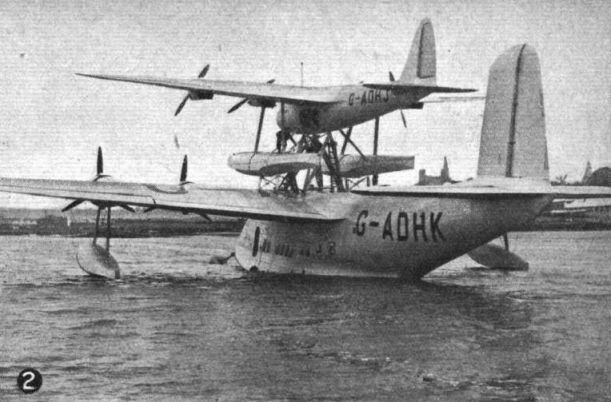 A Fairey Seal spotter reconnaissance floatplane (525 Siddeley Panther IIa) about to start a navigational training flight at Lee-on-the-Solent. 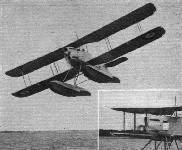 Delivery commenced of Fairey Seafox light reconnaissance seaplanes with Napier Rapier engines. The view is evidence of the clean running. 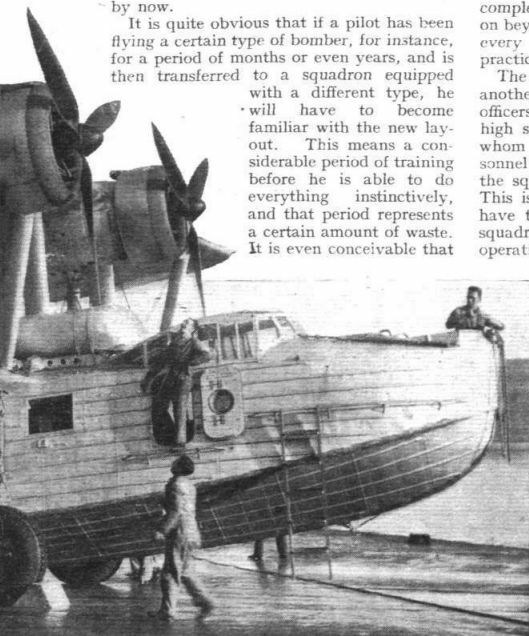 Excellent handling qualities - on shipboard, on the water and in the air - characterise the Seafox. The compactness of the Seafox when the wings are folded is apparent in this view. 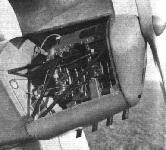 There is an ingenious arrangement for linking up the controls for flaps and ailerons when the wings are spread. Showing how the cam and claw arrangement links up the controls for the flaps and ailerons. 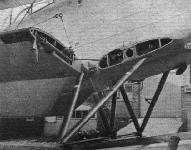 The left-hand view shows how easy it is to remove the tank of the Seafox through an aperture in the fuselage bottom, the installation of the Napier Rapier VI are revealed on the right. 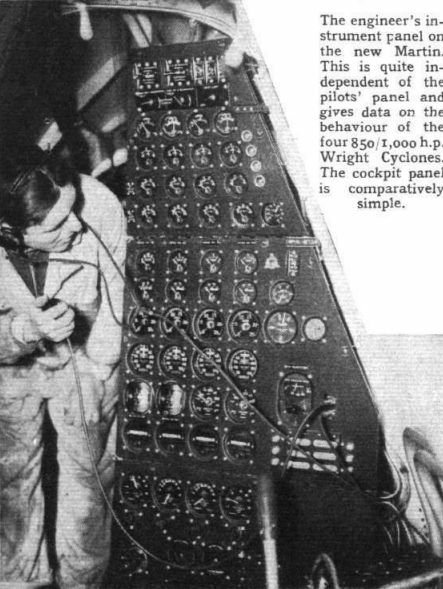 Though the observer has a cockpit enclosure, the working of which is illustrated here, the pilot of the Seafox is without a "greenhouse." 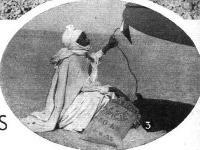 His duties when being hoisted on board ship demand freedom of movement. The large "exploded" sketch reveals how the Seafox is constructed in a number of units, facilitating the installation of equipment. 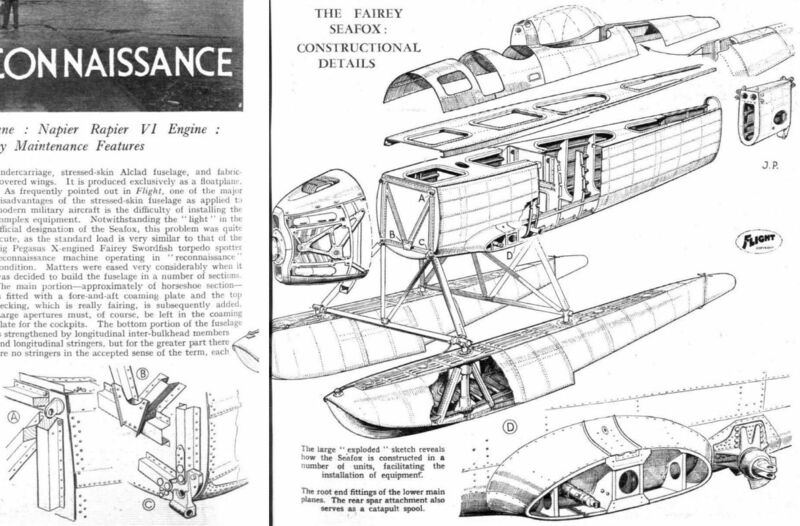 The wing construction of the Seafox is of fairly conventional two-spar fabric-covered type. 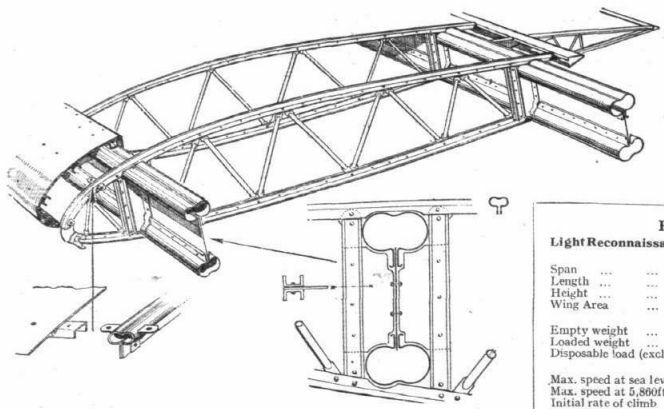 Drawn steel tubes are used for the booms, which are more or less of figure eight section. The wing tips are easily detachable. This sketch not only serves as a key to the accompanying drawings but indicates the general layout of the Seafox. 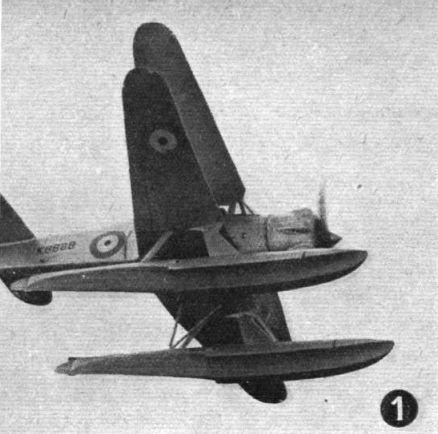 A certain affinity between the Seafox and previous Fairey floatplanes is suggested by the design of wings and undercarriage. SALT SEA SAILORS: Bristol Pegasus-engined Saro London flying boats of No. 204 (G.R.) Squadron, complete with long-range tanks, exercising in Plymouth Sound, whence they are due to take off to-day on a 30,000 mile flight to Australia and back. 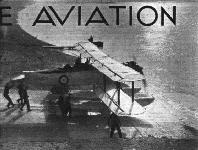 They will take part in the 150th Anniversary Celebrations in Sydney. 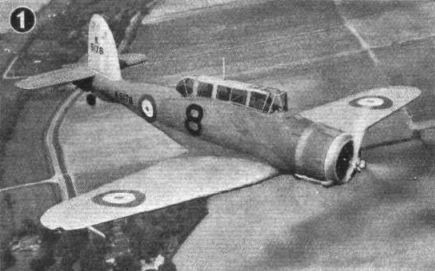 The Fairey P.4/34 light bomber is one fine example of 1937 military prototypes. 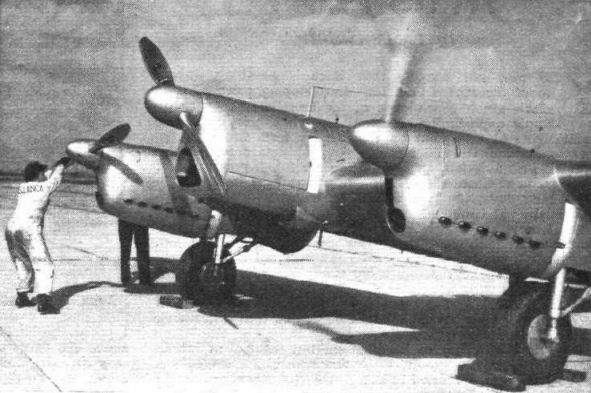 The Fairey has the liquid-cooled Merlin. 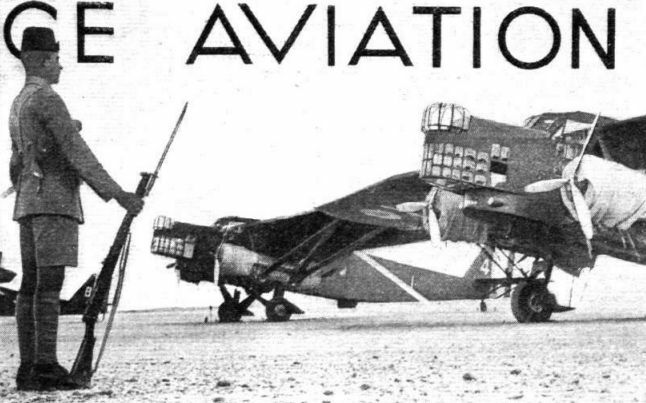 FAR EAST TERMINUS: The Imperial Airways D.H. 86 Dorado at Hong Kong after two years service on the Penang - Hong Kong service. From now on this service will cut across from Bangkok, thus shortening the flying distance. The Union Jacks painted on the fin and the wings are an efficient commentary on the present Far East situation. 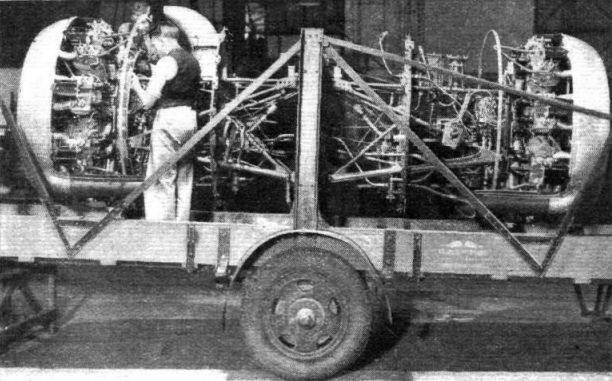 The complete power plant - two Pegasus radials - of a Handley Page Harrow heavy bomber on its way to be fitted. Standardisation of complete units is becoming more important, particularly for military purposes. 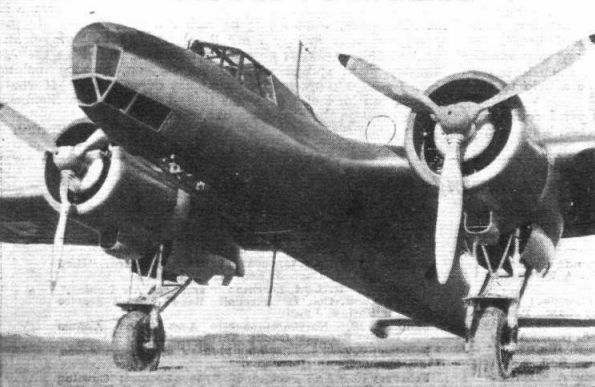 The twin-ruddered Marcel Bloch 131 medium bomber, which does 265 m.p.h. 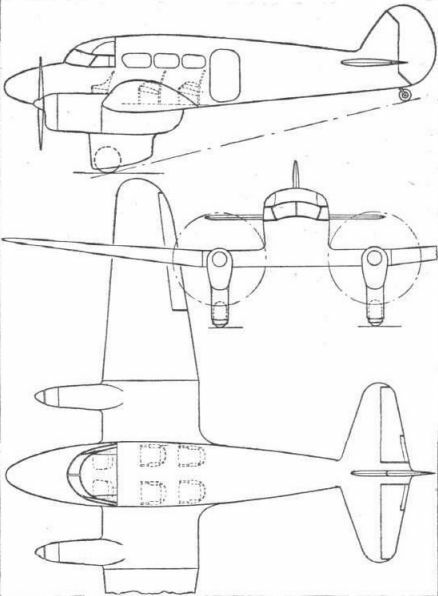 The nose of the Marcel Bloch 131 and 133 medium bombers were similar. Armament arrangements - if existent - were kept secret. 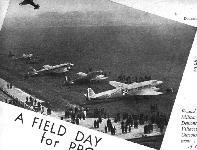 FOR PORTUGUESE INSTRUCTION: Part of a batch of Avro 626 comprehensive military trainers (Siddeley Cheetah V) at Avro's Woodford aerodrome prior to delivery to the Portuguese Government. Despite the fact that the 626 was designed some years ago it is still extremely popular. 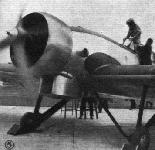 The D.H. Gipsy Twelve air-cooled inverted vees in the D.H. Albatross are cooled on a new principle, air being taken in through ducts in the wing. 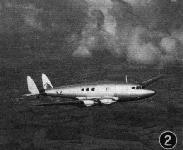 The de Havilland Albatross faced the camera in April and taxying tests commenced. 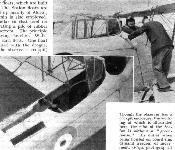 "Jock" Bonar, who has been doing the test flying of the Knight, poses this interesting little two-seater before the camera. The external stiffening battens on the wings are apparent in this view of the Knight. Vision, it will be gathered, is a strong point. 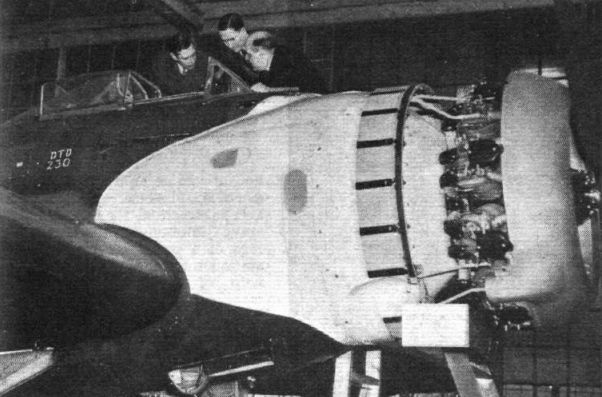 The installation of the Cirrus Minor engine is shown here. The personalities are, from left to right, Mr. J. McEwan King (managing director of the Deekay Aircraft Corporation Ltd.), Mr. S. C. Hart-Still (designer and director) and Mr. "Jock" Bonar, who has been doing the test flying. 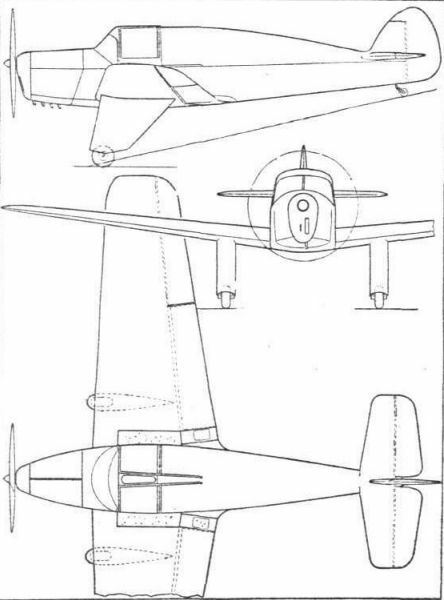 The proportions of the Deekay Knight are brought out by this scale drawing. 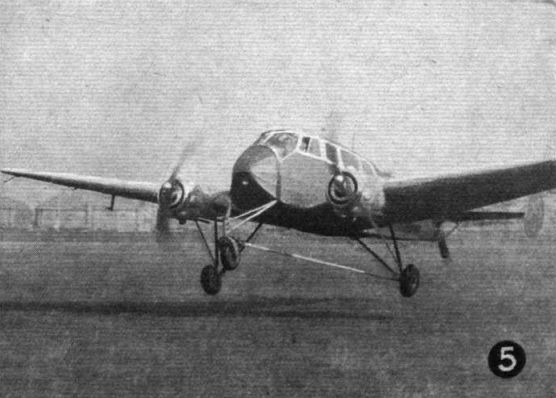 The Monospar with tricycle undercarriage was undergoing tests. 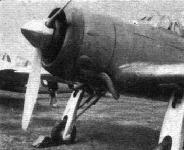 Fairly typical of a modern single-row installation is the Mercury in the Gloster F.5/34 fighter. The crankcase cowl is not standard. NOT SO PRIVATE: Child of a designer who, until comparatively recently, has concentrated on the production of private-owner types, the new Miles high-speed Service trainer has a number of features which would make it, in 200 h.p. form, an attractive device for the sporting pilot with (very) ample means. Capable of 295 m.p.h., the Miles Kestrel Trainer has great potentialities as a first-line military type. 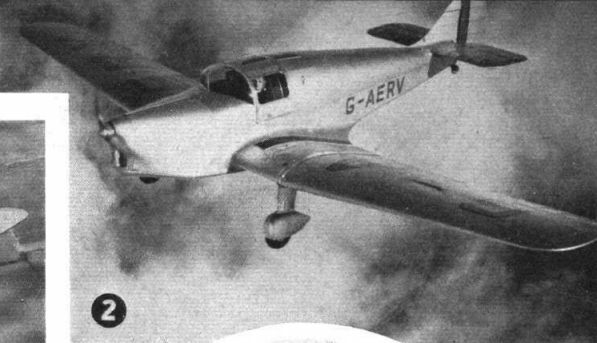 The engine is a Rolls-Royce Kestrel XVI. Quite delightfully clean, even with a fixed undercarriage, the Q6 with retractable wheels will be uncommonly attractive. 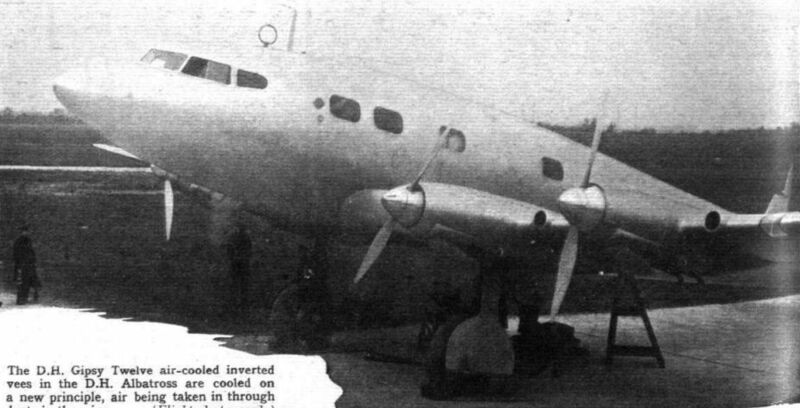 KEEPING US ON THE MAP: The dearth of truly modern British commercial aircraft types is met to no unimportant extent by the introduction of the Percival Q4 and Q6 twin-engined monoplanes. Apart from being attractive propositions for the private owner the newcomers should be useful for charter and feeder work. 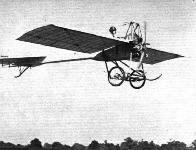 This attractive view shows the prototype Q6 (Gipsy Six IIs), with fixed undercarriage, flying near Luton Aerodrome the other day. Despite the comparative roominess of the cabin the new Percival is of attractive external form. The efficient windscreen shape is discernible here. 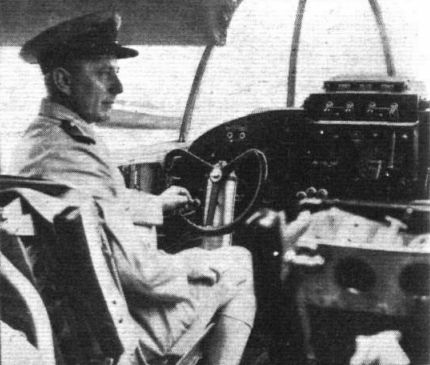 Captain Edgar Percival at the controls of the prototype Q6. 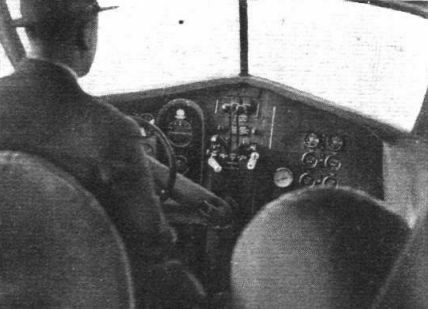 It will be gathered that there has been no stinting of elbow room in the cockpit, nor, for that matter, in the cabin. 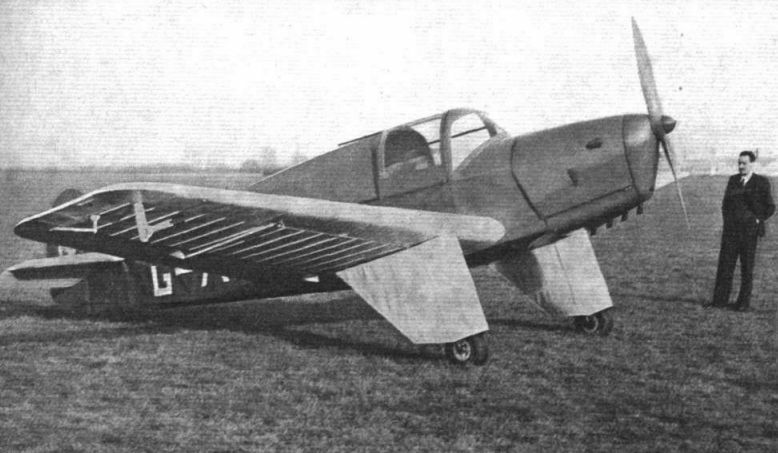 The "backbone" of the Percival Q6 showing the box type of fuselage construction and the framework beneath the ply-covered nose. 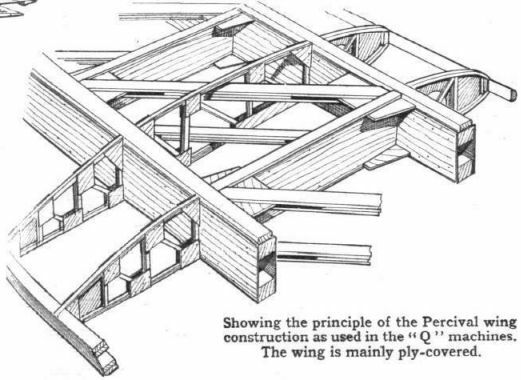 Showing the principle of the Percival wing construction as used in the "Q" machines. The wing is mainly ply-covered. 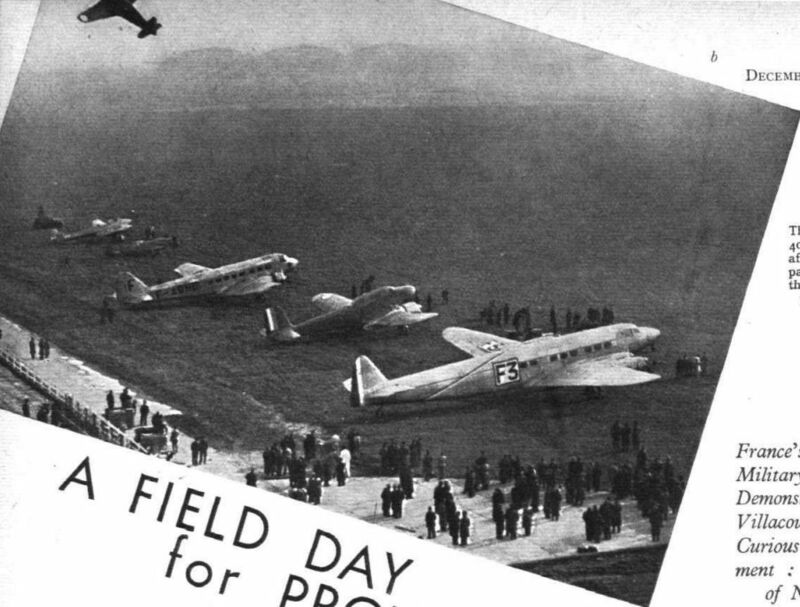 BALTIMORE INAUGURATION: Some of the crowd of 30,000 lining the banks of the Patapsco river to watch the recent inauguration of the new Baltimore Airport for landplanes and marine aircraft. 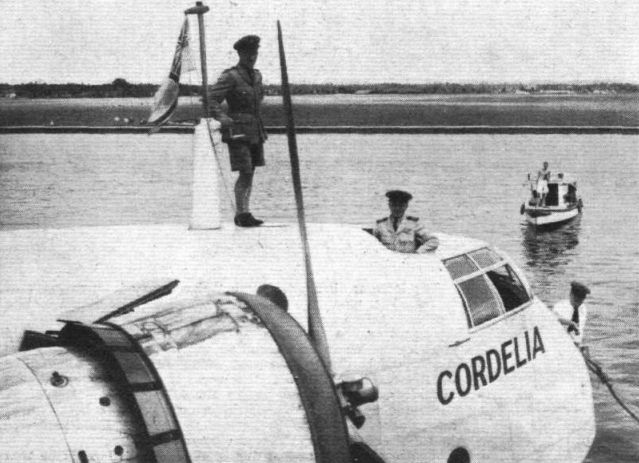 It replaces New York as the terminus of the Bermuda route; the Sikorsky S.42b Bermuda Clipper is seen being brought to the landing stage, and in the background is the Short Empire boat Cavalier. 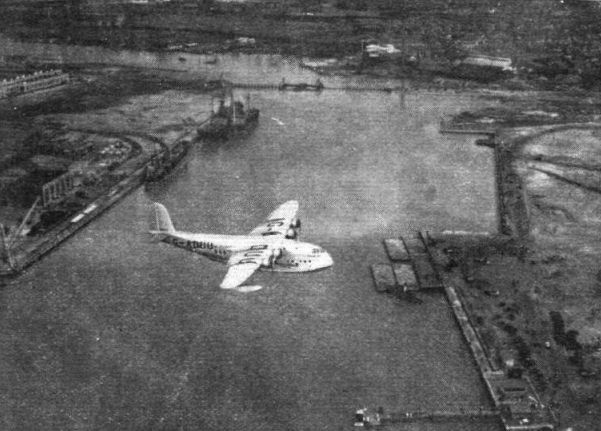 ATLANTIC TERMINUS: Cavalier flies over the new land-sea air base at Baltimore. 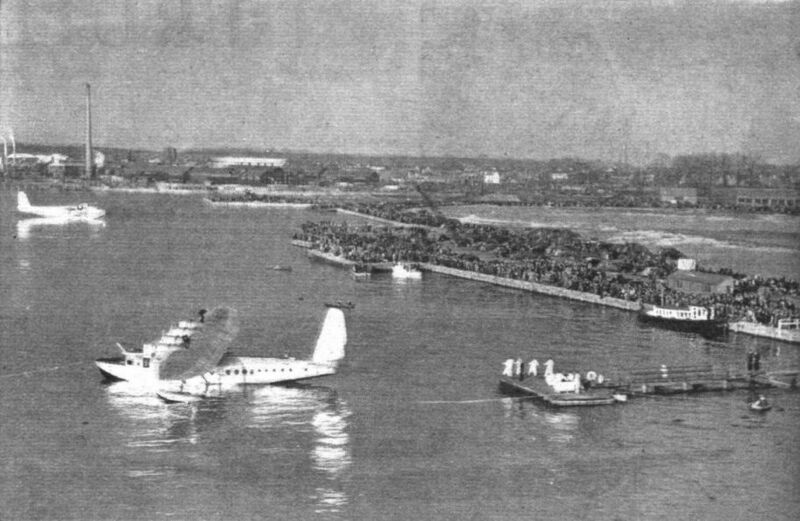 The seaplane jetty is in the lower right-hand corner of the picture with the airport site behind it. FAR EASTERN SURVEY: The Short Cordelia, which has recently returned from a survey of the new boat route as far as Singapore, swings at her moorings in Kallang Basin. 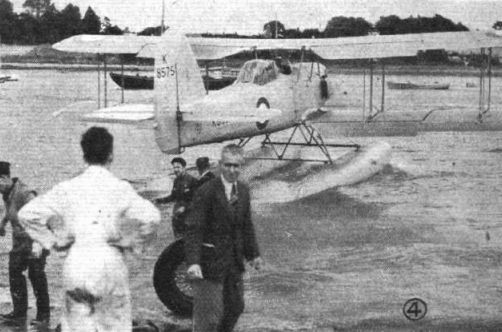 Singapore airport is in the background and the personnel to be seen are, from the left, First Officer Stone, Capt. Egglesfield and Radio Operator Coster. 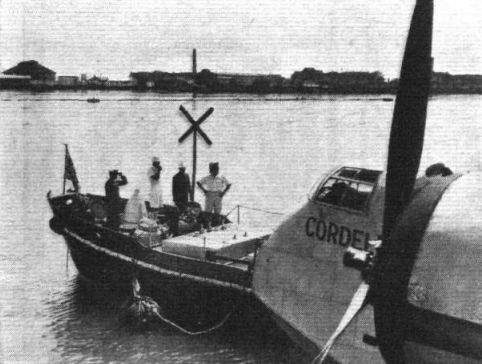 FAR EASTERN SURVEY: Another attractive picture of Cordelia in preparation for refuelling at Singapore. The tropical uniforms seen in this picture make a European winter appear to be particularly hard. FAR EASTERN SURVEY: A "close-up" of the commander, Capt. L. A. Egglesfield, in the control cabin. The sun-blinds above Capt. Egglesfield seen in this picture make a European winter appear to be particularly hard. 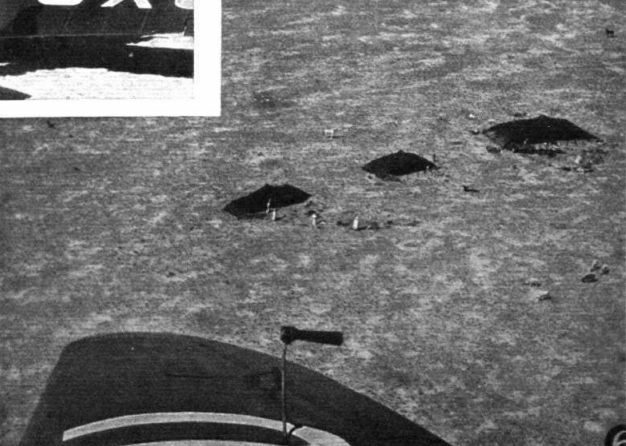 The 300 m.p.h. 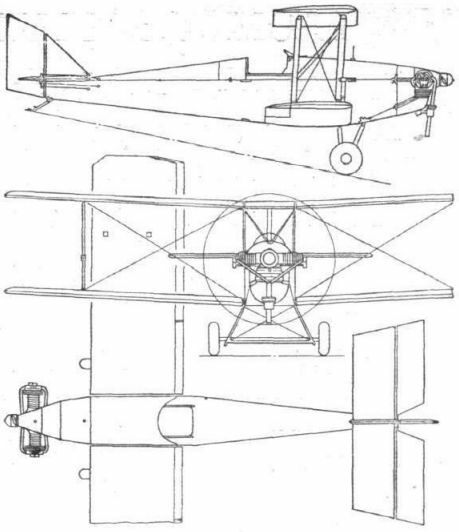 Nieuport with Hispano Suiza Series Y engine and wing-mounted radiators. 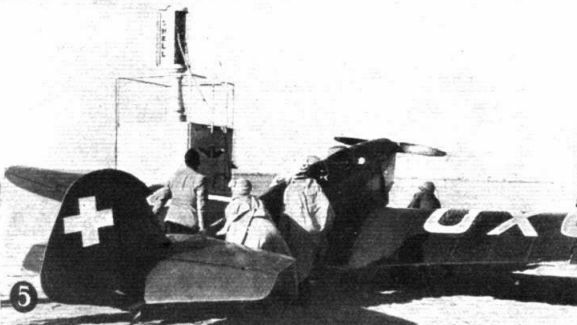 The Potez light observation machine has two Potez radials and an underslung observation car seen to advantage here. 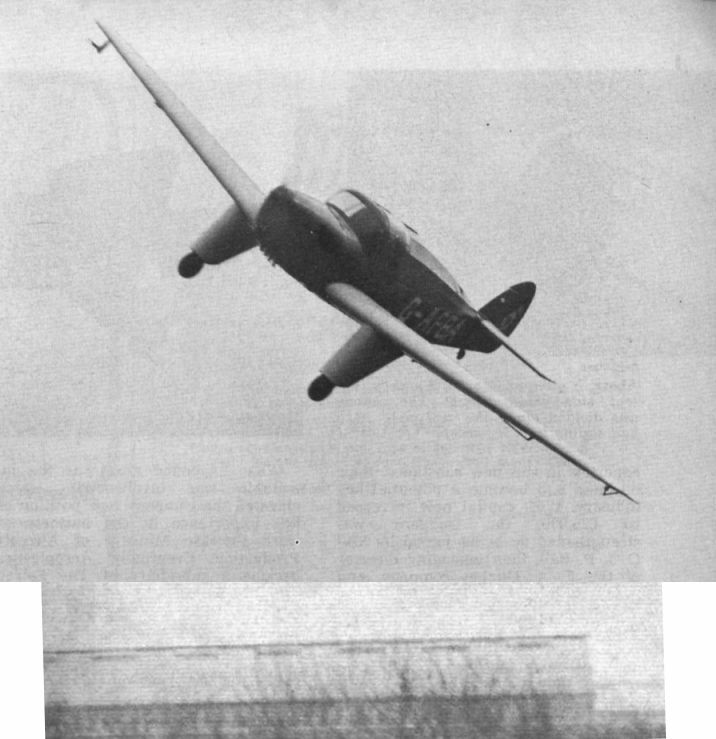 FLICK ROLL: Rarely have we seen a photograph which so adequately conveys the true aerobatic flying impression as this or a Bucker Jungmeister which, according to the caption sent with it, is in the act of starting one of the machine's characteristic flick rolls. A formation of Breda 64s, from which type the 65 has been developed, are seen nosing out to sea. 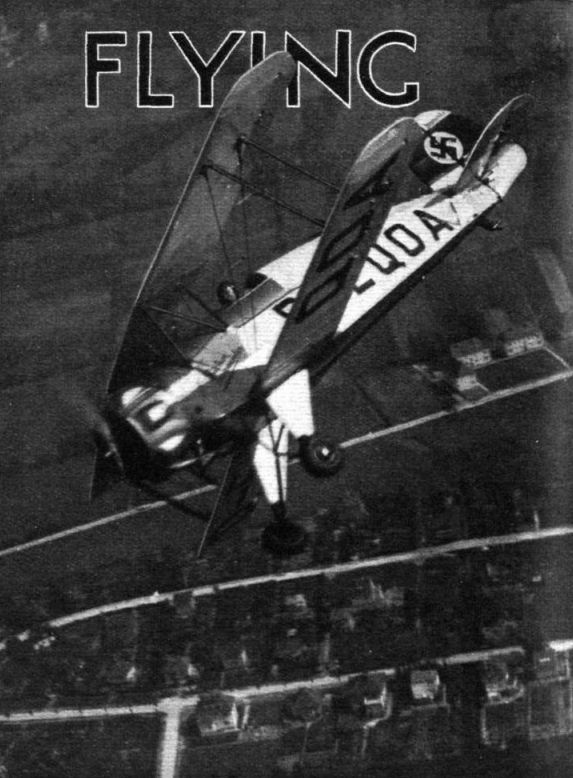 ASSORTED POWER: The special Bellanca monoplane in which Capt. 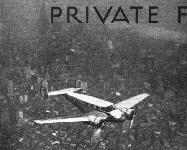 Papana, the Rumanian pilot, intends to fly from New York to Bucharest. In the nose is a 420 h.p. Ranger vee-twelve; the outboard motors are 250 h.p. six-in-line Menascos. It is said to have clocked over 300 m.p.h. on test. OVERWEATHER: An impression through the port windows of the control cabin of a British Airways Electra flying in the sunshine at 9,000 ft. over what is probably a damp and dismal English countryside. RUSSIAN CLIPPER: Virtually a scaled-up and improved version of the Model 130, this new Martin boat has been built for the Soviet Government. With a span of 157ft. it will carry 46 passengers by day or may be fitted with sleeping accommodation for 26. 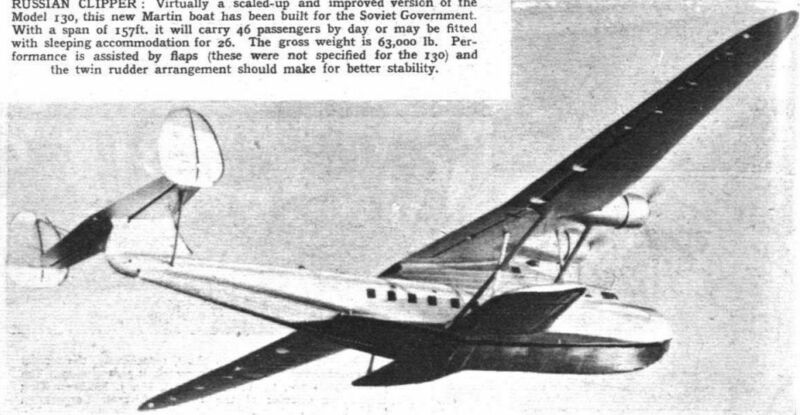 The gross weight is 63,000 lb. 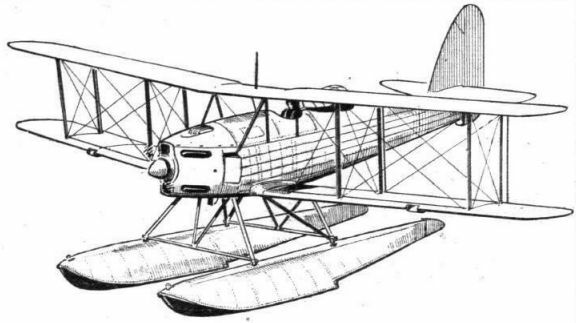 Performance is assisted by flaps (these were not specified for the 130) and the twin rudder arrangement should make for better stability. 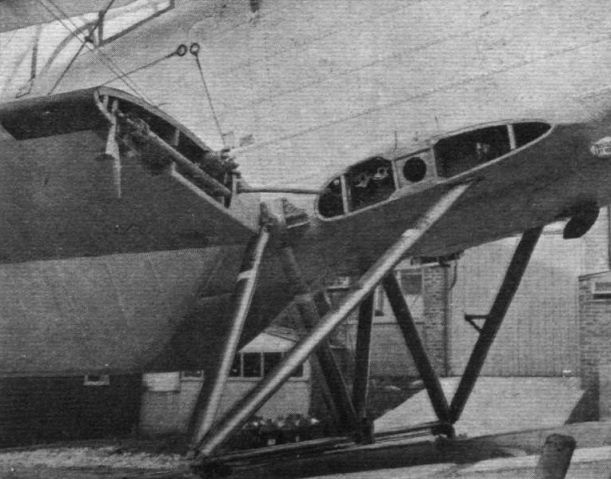 A close-up of the forward upper portion showing the installation of the Cyclones with their gilled cowlings. 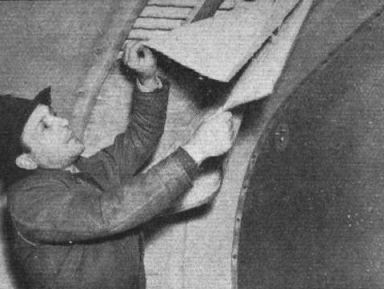 A workman reveals the soundproofing in the cabin walls of the Martin 156. The engineer's instrument panel on the new Martin. This is quite independent of the pilot's panel and gives data on the behaviour of the four 850/1,000 h.p. 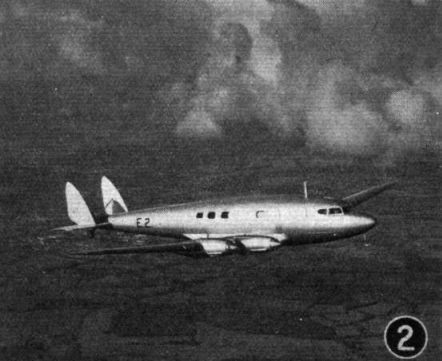 Wright Cyclones. 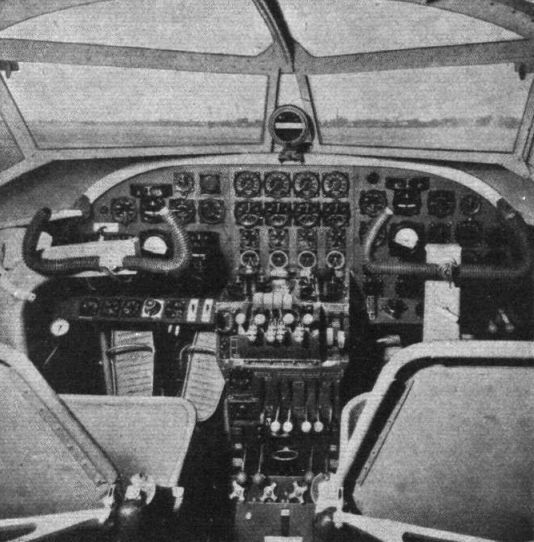 The cockpit panel is comparatively simple. This beautiful sterling silver model of his Miles Whitney Straight was presented to Brig.-Gen. Lewin by the directors of Phillips and Powis Aircraft and of Whitney Straight, Ltd., in recognition of his fine performance in the King's Cup Race. It is the work of the Goldsmiths and Silversmiths Co. 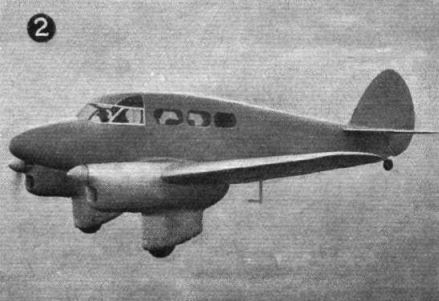 ECONOMICAL TRANSPORT: One of the two five-passenger Pobjoy Scions used by Palestine Airways on services linking the towns of Tel Aviv, Haifa, Jerusalem and Lydda. 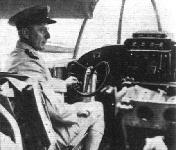 The chief pilot of the Company is Capt. 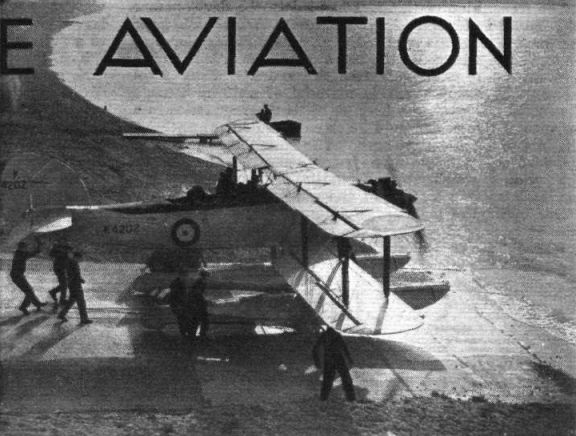 Andrews, who was previously in the service of Imperial Airways. 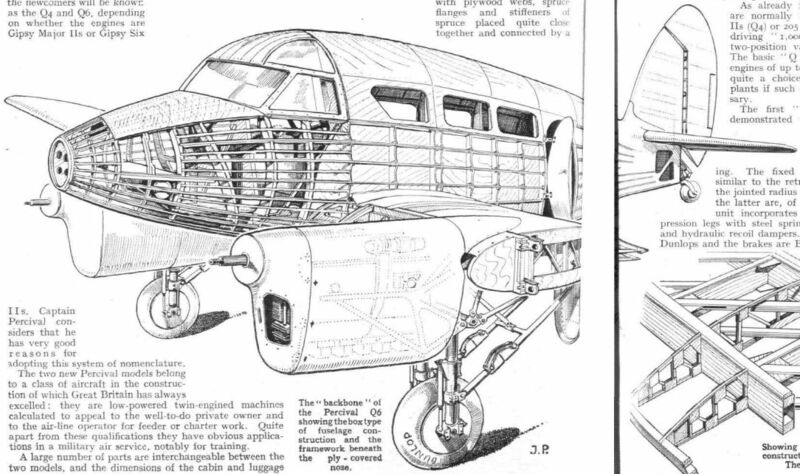 The new engine cowlings and the slightly modified pilot's window arrangements are worth noting. 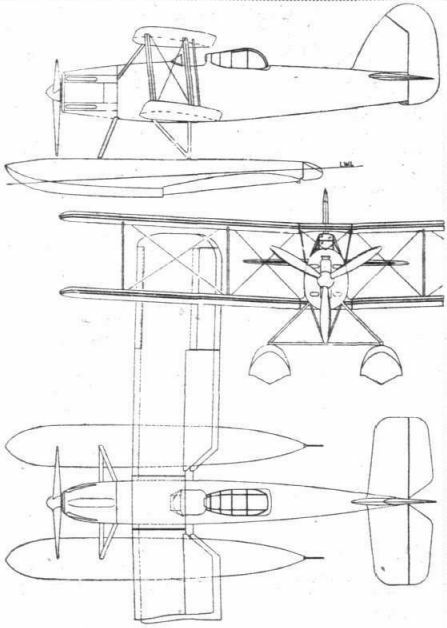 General arrangement drawings of the Lympne single-seater. 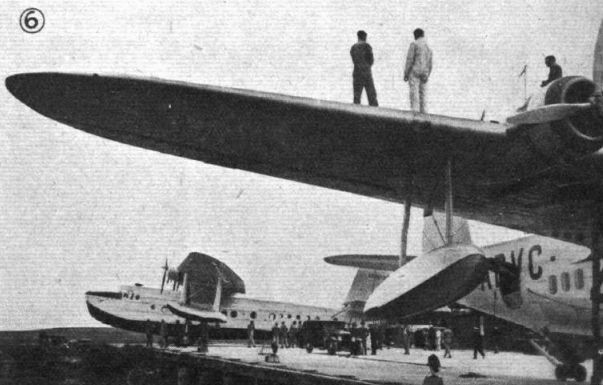 A FRENCH ATLANTIC HOPE: The Latecoere 631 flying boat designed for service over the South and North Atlantic. The top speeds available on the two routes will be, respectively, 264 m.p.h. and 217 m.p.h. The six engines will be Gnome Rhones and dimensions are: span 187 ft., length 141 ft., height 33 ft. Accommodation is made for 20 passengers, a crew of eight, and 3 tons of freight. Passengers will have private cabins and amenities will include a shower bath and a promenade deck. 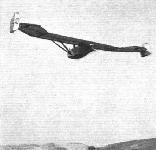 An old example of tailless sailplane such as was suggested by Sqn. Ldr. Buxton - the Stadt Magdeburg.